Valentines Day is just around the corner, and I love it! I’m a romantic, so it’s one of my favorite holidays. In honor of Valentines Day, I’ll be posting some love stories–beginning with my own. When I was young(and I mean young) and dating, I tried to fall in love with everyone that I dated. I’d only been dating about a year when I met my future husband, but I’d had my heart-broken a couple of times already–at the ripe old age of “just under 15”. I think back now, and realize that I was just a child, but I believe love knows no age limits. So I was already a bit cynical about love, when I met Ed on a blind date. He was five years older than me, and had recently signed up to serve in the army. I didn’t really see a future there…but was I wrong! We met on August 3, 1969, and by October–or maybe even before then–we knew that we were meant to be together. Around this same time, I remember telling my mother that we were planning to get married, and she laughed. To this day I don’t get the humor. I was young, and still needed to finish high school, but I promised Ed that I would “wait” for him while he did his tour of duty in the army…and that’s what I did. Oh how I wanted to quit school, and go with him, but he would have none of that! He gave me an engagement ring on August 15, 1970–just over a year after we met–and just prior to his deploying overseas for 20 1/2 months. I was still only 15 years old when I became engaged to my future husband. Time passed, sometimes slowly…all we had back then were letters, and cassette tapes. He called twice during the 20 and 1/2 months that he was away (it was very expensive to call). I completed eleventh and twelfth grades while he was gone. We withstood the test of time and being separated, and married three weeks after he returned from his army duty. 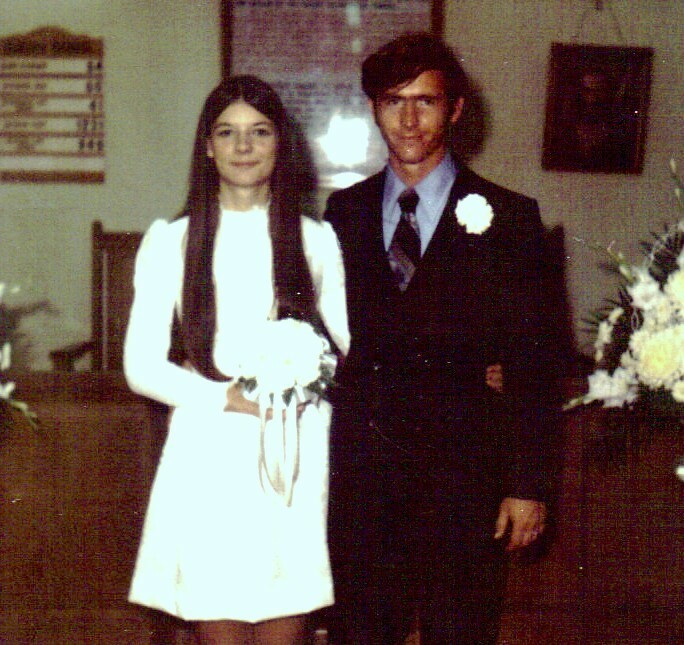 Our wedding was on June 18, 1972…I was 17 years old, and he was 22. We married quickly because I couldn’t stand the thought of being apart any longer! Ed found a job about 60 miles away from where our parents lived, and we moved there to begin our marriage. Looking back, I realize now how difficult it must have been for my parents to see me move away so quickly. Ed and I came “back home” every weekend for a long time though. I remember my mother sharing with me how difficult it was for her the first few times Ed and I slept in my old bedroom together. She said that she wanted to “jerk Ed out of that bed” (ha) . I could appreciate that thought once I had a daughter of my own! …And so began the love and marriage of Ed and Kathy. A very unlikely couple, it would seem, but who knew? Our love has withstood the test of 3 years of separation before marriage, raising three children(whew), our illnesses, the old age and death of our parents(except his mom), and now as we are entering our golden years it will have to withstand the ravages of our own old age. We are different in some ways than we were forty years ago when we began our journey together. We are no longer those two young people. We talk about old age all the time. The graying and loss of hair, sagging skin, wrinkles, aches and pains, extra weight..we grumble more than we used to about any and everything…a sure sign of getting old! However, one thing hasn’t changed, and that’s our love and commitment for each other. He’s still the one…and always will be… I know he feels the same way about me. This is just beautiful. I could feel the love in your words. Congratulations! You sound like you feel very lucky, and I know you are, but more than that I think you must both really be great people. Take care of each other! Can I just say, AWWWWW……..
Love your story :o) Truly a blessing! We were young too…and boy, our kids remind us of that all the time :o) I moved away from my family in Wisconsin to New Mexico, and it was very hard for my mom. At the time, we felt we were so grown! We were actually babies!